Korean Developer VRillAR has released Dead Ground Arena On Viveport and Steam.Dead Ground: Arena is an action-packed FPS VR game and an arena version of Dead GroundZ. Owners of the HTC Vive can experience exciting, action-packed fights against up to thirty different types of enemy in an atmospheric environment that brings the threat to life. Korean Developer VRillAR has many years of experience creating VR products and is now branching out into the video game market with Dead GroundZ and Dead Ground: Arena. The ambitious Korean studio is making use of the powerful Unreal Engine 4 environment that throws the player into an immersive, zombie-infested VR world. In this game, you become an agent of a secret company, Blackrain, for whom they are sent on a range of challenging missions. 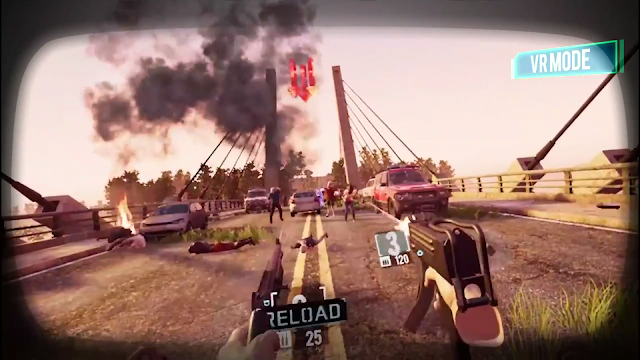 In order to complete their objectives, players will be able to choose more than 20 different types of weapons. Sometimes you should protect specific character or survive in a dangerous zone by eliminating around 30 types of unidentified creatures. Dead Ground: Arena supports both teleport movement and direct player movement allowing players to find their ideal control scheme along with a number of options to ensure a smooth gaming experience. You'd better enjoy the normal mode first and if you feel it easily, then just try the next level, veteran mode. Also, you can change many options such as graphics quality for your convenience. Dead Ground: Arena is available in English with 34% launch discount for €9,89/$9.99 on Steam as well as via Viveport. An HTC Vive is required to play.